Former NHL referee Bruce Hood spoke at St. Andrew’s Presbyterian Church in Hillsburgh over the weekend, discussing his fascinating life and career. Dubbed an “Inside look at Referring,” the presentation last Saturday, June 3, was a slide show showing photos and videos of his long career. Now 81, he officiated his first Intermediate hockey game in 1957 after a linesman was cut in a game he was serving as a back-up for. During the 1961-62 season, he served as a linesman in his first full season in the OHA Junior “A” league, before eventually being called to officiate in the NHL. Mr. Hood had a long career in the NHL. He spent 21 years there, from 1963 to 1984, during which he officiated 1,033 regular season games, 157 Stanley Cup playoff games, three All-Star Games, and three Canada Cups. 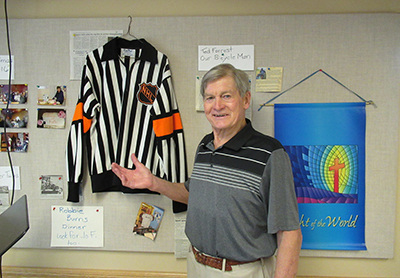 He was the first professional to referee a World Championship game in 1985 in Prague, Czechoslovakia, and was instrumental in the formation of the NHL Officials Association in 1969.